Horses have been boarded at the corral since the Association was established in 1972. We have space for eight (8) horses in the corral and pasture area(s). 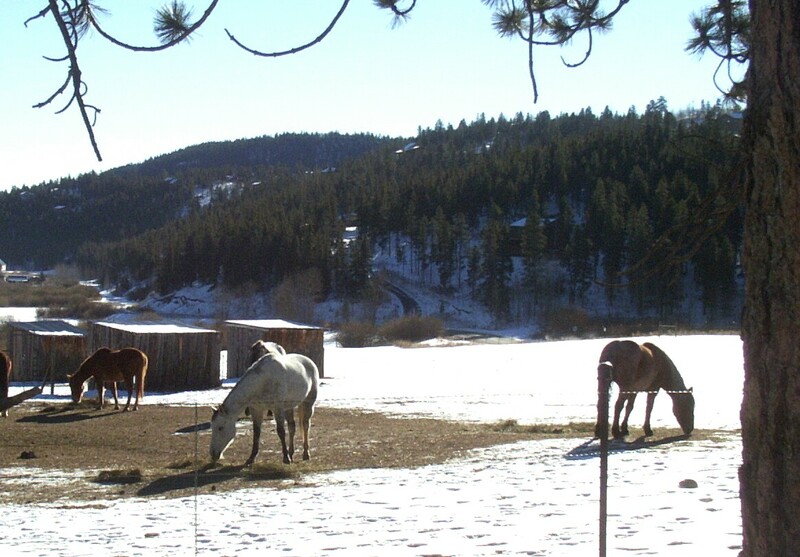 As spaces become available Elk Creek Highlands/Meadows Property Owners Association (ECHPOA) members and those outside the subdivisions have the ability to board horses on Association Property by paying a monthly fee. Openings for new boarding positions will be posted through emails to the ECHPOA members, on this blog, and on the bulletin boards near the mail boxes. Anyone interested in these openings may submit an application. All new boarders will be interviewed and approved by the current boarder clients and the Board of Directors of ECHPOA. Criteria considered during the interview process include but not limited to; current boarder, number of horses per household, length of ECHPOA membership, residence status, amount of time a boarder is able to contribute to corral maintenance and chores, and horse temperament. The boarding fee is $50.00 per month for ECHPOA members or $125.00 per month for residents outside the subdivisions. However, Member Clients who were renting from ECHPOA prior to January 1, 2016 shall remain at $35.00 per month until changed by the ECHPOA Board of Directors. Money spent for corral improvements come out of the funds received from membership dues and boarding rental. For more information about membership, see the About ECHPOA page. ECHPOA accepts no responsibility for horse or rider/owner resulting in injury or death AS POSTED. ECHPOA will provide hay storage which will be divided by eight sections, one section per horse. No alcohol, illegal drugs and/or smoking are permitted at the horse corral/pens/riding arena. Only those with horses boarded on the property are allowed in the corral and pasture area(s). All guests or invitees must be accompanied by members with horses boarded on the property. Please do not try to feed or pet the horses through the fence. Parents are responsible for keeping their children away from the fence/corral area(s). No children less than 12 years of age are allowed in the horse corral or pen areas without a supervising boarder or other adult being present. All dogs on the Premises must be kept under leash control at all times. All horse boarders will be responsible for providing veterinary care for their horse. All horse boarders will share in cleaning the corral grounds, repair and maintenance on fencing and buildings. All horse boarders will share in the cost of electricity for water tank heaters when they are needed. All boarding fees must be paid to ECHPOA between the 1st and 16th of each month, 86 Elk Creek Road, Bailey, CO 80421, or delivered at the monthly association meeting. A late fee of $25 per horse shall be charged if boarding fees are not received by the 16th day of each month.